Social justice has been the focus of Muslim activists and communities in recent times. Does the Islamic tradition contain relevant principles that can be drawn upon to inform social justice work? This On-Demand Course, with Shaykh Walead Mosaad, will seek to address that question. Social Justice In The Islamic Tradition: Righting wrongs, enjoining good, and honoring individual and community rights. Social justice has been the focus in recent times of Muslim activists and communities. More often than not, the methods and objectives employed in Muslim social justice work have drawn from practices of other communities and traditions not necessarily rooted in Islamic principles. 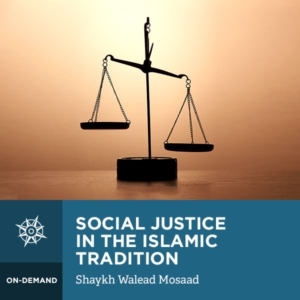 Shaykh Walead Mosaad explores the history and roots of some the modern paradigms of justice while contextualizing the principles of our tradition. Does the Islamic tradition contain relevant principles that can be drawn upon to inform social justice work? This On-Demand Course will seek to address that question.